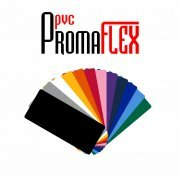 ﻿ Economical Flex PVC for cutting by plotters and textile transfer. PromaFlex PVC is a mat aspect film without adhesive carrier which enables a quicker weeding, more appropriate for big numbers, letters and logos. This process will save a considerable amount of time and, added to its low price, it will increase productivity. PromaFlex PVC suits applications on various textiles such as cotton, polyester, acrylic etc. Its thickness provides a high covering power on dark textiles and great washing resistance.